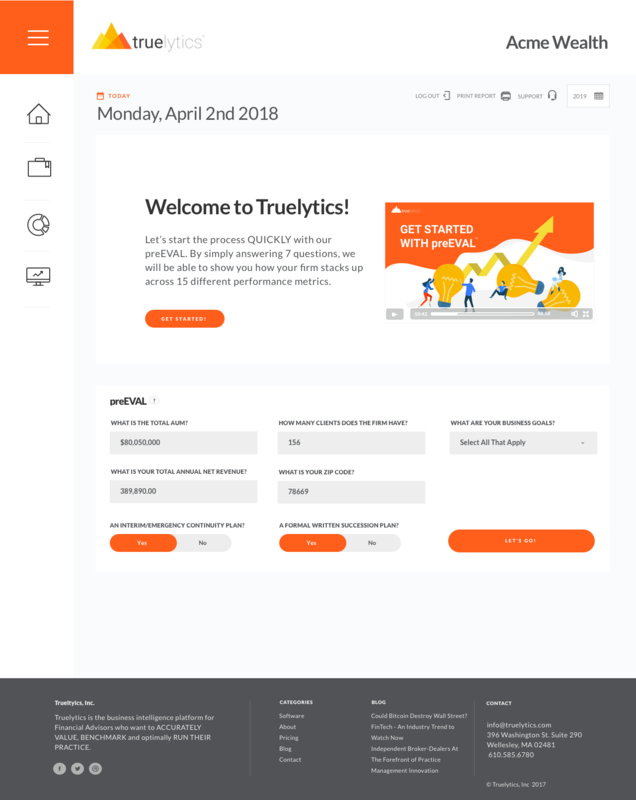 Truelytics Is Your Dashboard To Success! 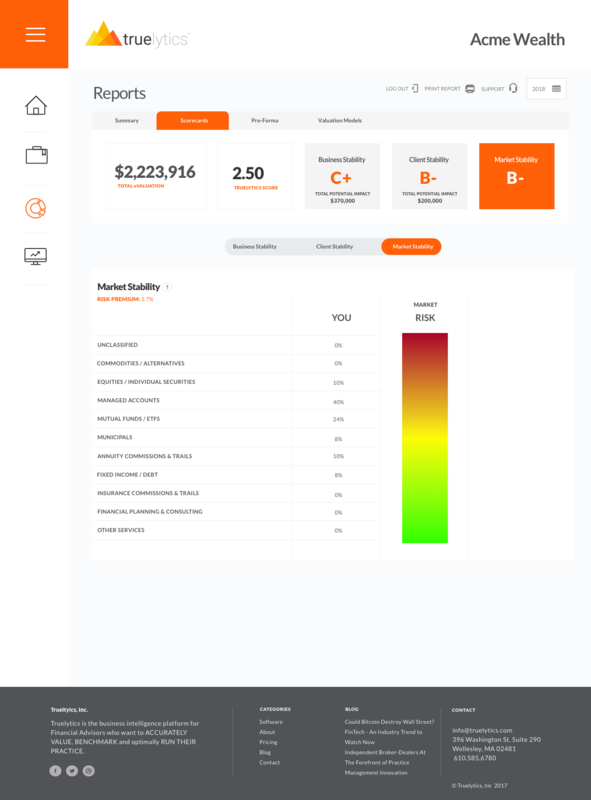 Truelytics is the only online self-service platform in the Wealth Management industry that gives you the ability to truly understand the value of your entire practice based on its unique characteristics, from the effects of earnings contributions to the impacts of key strengths and weaknesses. Your management decisions will be objectively informed in real time, enabling you to confidently advance your business directly, without expensive outside consultants. 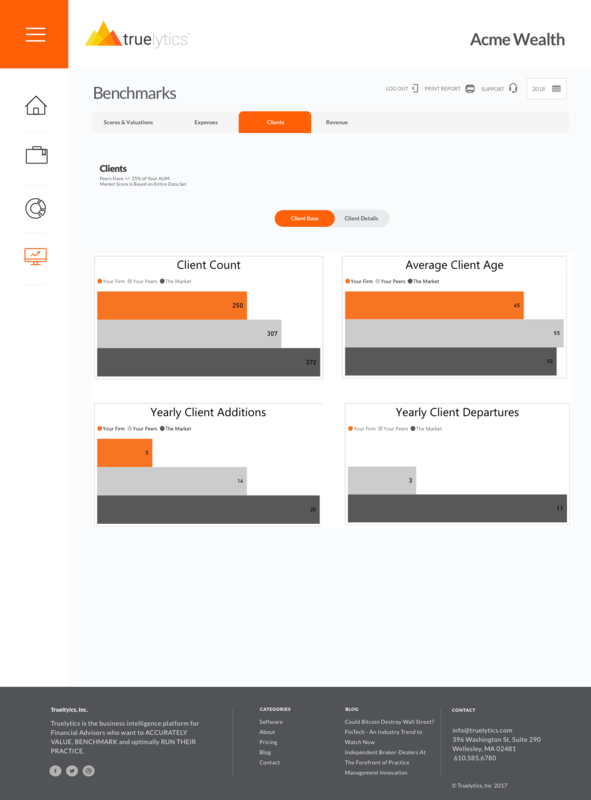 See the present value, five-year projected cash flows, and client count forecasts for each of your advisors. Measure and monitor every aspect of each advisor’s contribution to overall performance. 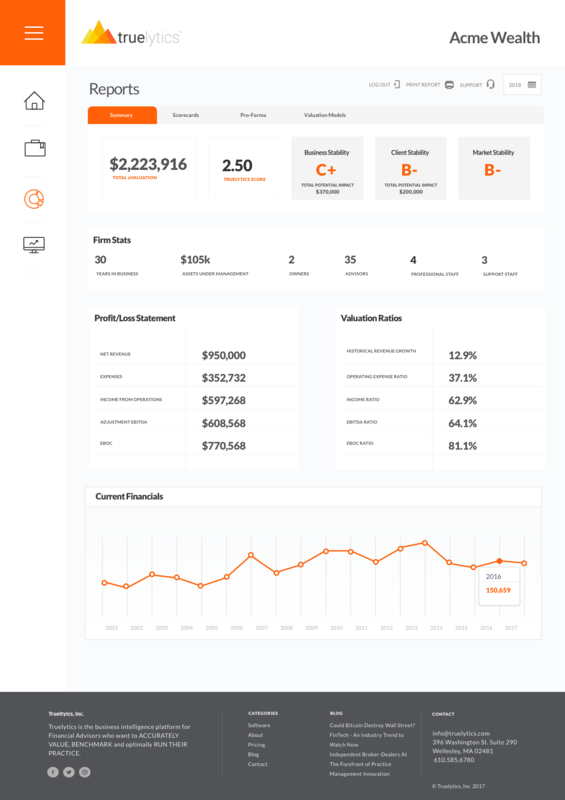 Our continually updated platform allows financial advisory practices and wealth management firms to easily analyze their operating and portfolio dynamics against key performance metrics, and to take objectively informed actions to optimize management efficiency, deliver a better and more profitable client experience, and maximize the market value of their businesses. Using our technology and industry guidance as the framework for success, Sellers, Buyers and Successors will strengthen their negotiating position. Sellers will benefit financially and strategically when using Truelytics to prepare their business for eventual sale. Buyers will gain improved leverage and make more informed decisions by having the data they can trust to their advantage. 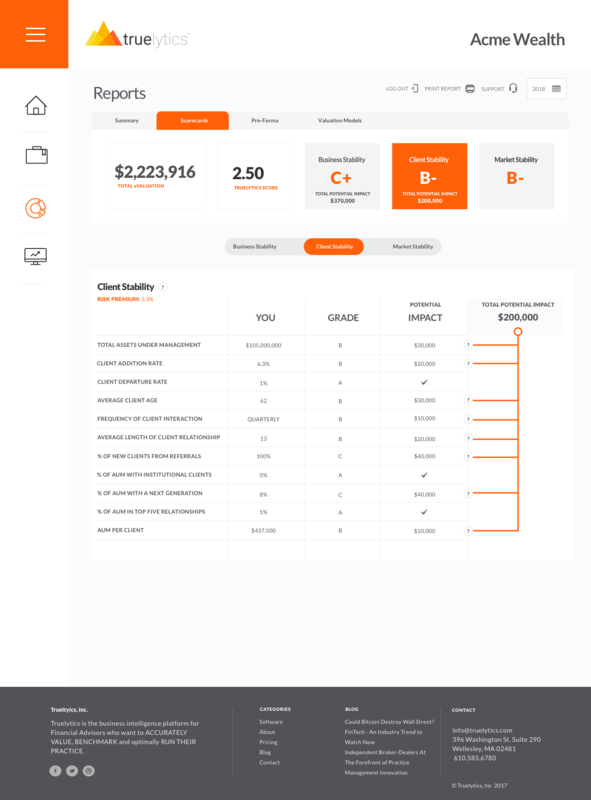 The foundation of our technology is based on data gleaned from tens of thousands of actual (“blind”) advisor tax returns; state of the art Key Performance Indicators; and multiple Investment Banking formulas. The results: Data that Matters™, data you can trust. Reflects the structure and operations of your firm. 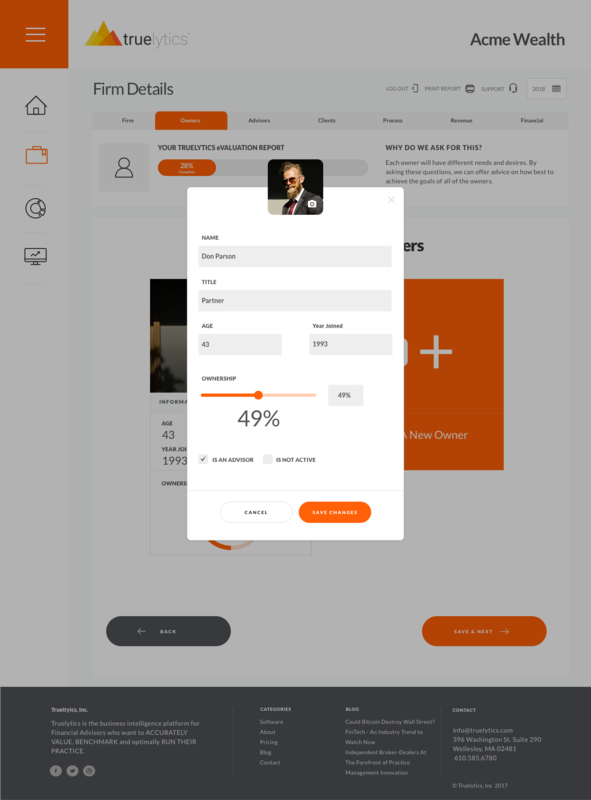 Reflects the demographics and turnover of your client base. Reflects the amount of market risk inherent in your revenue streams. Have you ever wondered how you stacked up against your peers? How about against the market at large? Maybe you are the competitive type, always looking for ways to be the best in the industry. Regardless what drives you, you will be happy to know that Truelytics is now offering benchmarking. Our most important asset is our relationship to you. Your personal information will never be shared with a third party and your data is secure. Our platform uses 128–bit SSL encryption—the same security that the best Global Banks use. All data and transactions are protected by COMODO. Provides us with a thorough report to assess an advisors business. There is nothing like it in the marketplace. The most valuable time I have spent in business.